Gainford Drama Club’s 60th Anniversary production When We Are Married, directed by Allan Jones, appropriately portrays another anniversary celebration, this time for the silver wedding of three couples in the West Riding of Yorkshire at the beginning of the twentieth century. The immaculately crafted play concerns itself in typical Priestley style in how the self-satisfied burghers of Clecklewyke react when an outsider, “lah-di-dah Southerner” Gerald Forbes (Paul Richardson), arrives to question their social foundations. This is the third time thatGDC has staged this particular work of J B Priestley (previously in 1965 and 1979) and repeats the success of Dangerous Corner (2004) and An Inspector Calls (1995), the latter also directed byAllan Jones. The celebration planned to take place in the home of Alderman and Mrs Helliwell (well played by Mike Sillars and Fiona Minay) is disrupted by the bombshell that the parson who married them was not authorised to perform weddings; technically therefore all three couples have been living in sin for twenty-five years. 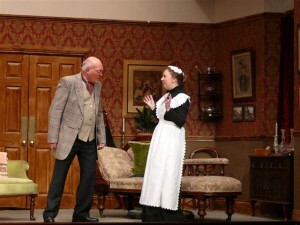 The self-important Alderman Helliwell vainly tries to co-ordinate a response to the news, only to have the defensive bubble burst by the arrival of attractive, easy-going barmaid Lottie Grady (JeanMcCann) come to call him to account for his promises of marriage during a sojourn inBlackpool. This distracts them from investigating Gerald Forbes’ romance with Alderman Helliwell’s pretty niece, Nancy (Katie Stowe-Smith) any further. More scandal looms in the shape of gossipy, revengeful Mrs Northrop (Ronnie Lowery) who has to be restrained in spreading what she has overheard by the ponderous Reverend Mercer (Chris Allcock). The other two couples share a pompous, hectoring partner and a timid, put-upon spouse; Councillor and Mrs Albert Parker (John H Robinson and Christine Deering) and in the reverse, domineering Clara Soppitt (Jan Richardson-Wilde) and the downtrodden Herbert Soppitt (Lawrence Chandler). All three couples get their chance to review (and ultimately) renew their marriage vows, the worms turning with verve and considerable humour. The elderly, alcoholic Yorkshire Argus photographer, Henry Ormonroyd (John Chadwick) wins over the audience’s sympathy with his homespun philosophy, particularly in his scenes with the chirpy but gormless Ruby Birtle, delightfully played by Susannah Carol. With so many accomplished performances and confident direction it is difficult to pick out any one actor for commendation but tributes should be made to those making their debut at the theatre (Christine Deering, John Chadwick, Fiona Minay, Katie Stowe-Smith and Susannah Carol) who all showed promise for the future. The combination of established, popular actors together with new faces gave audiences a polished, soundly directed production which was clearly much enjoyed. Mention must be made of the set construction and dressing which added to the atmosphere of the period with major contributions from John Lowery and Joan White, with Ronnie Lowery making several of the costumes. 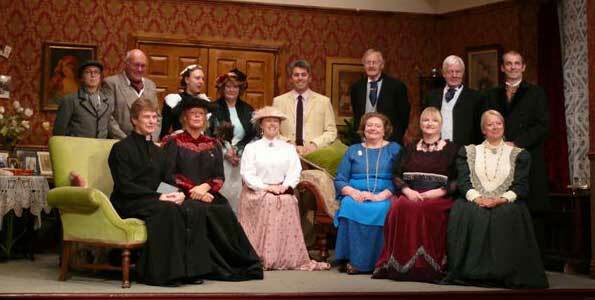 Overall, this production was an excellent example of Gainford Drama Club’s finer qualities – team work, attention to period detail and comedy timing and was a good choice for this anniversary production.